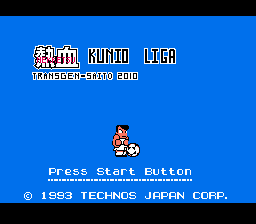 Like almost everything Technos has ever made, Kunio Kun Soccer is a tribute to violence. It’s a sequel to World Cup Soccer, which is the American bastardization of another Kunio game. Along with all the normal violence you’d come to expect from a Kunio sports game (namely, the ability to beat up other players to gain possession of the ball), this game offers some other interesting features. You have some weather effects, which make things more difficult by adding stuff like wind gusts and lightning strikes (which fry anyone who happens to be standing in a puddle). ALl the weather effects seem to tax the NES, however – thanks to good old slowdown. You also get to strategize, and tell the other players what to do, though most often they’ll ignore you and run in circles and pass the ball to absolutely no one. Also this game supports up to 4 players which in the 4 player-mode, 2 players compete against another 2 ones. In each side there are one forward and one Goalkeeper. The rest of the players are controlled by CPU. It’s an alright game, but there’s probably much more soccer fun to be had elsewhere. 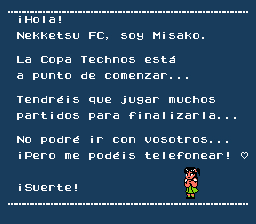 This is a Spanish (European) translation of this great soccer game. 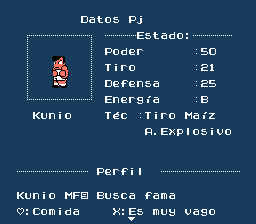 The Spanish translation is based on the previous translation by PentarouZero. 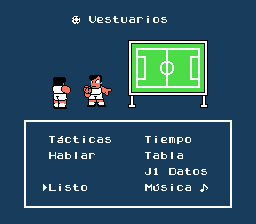 This translation features some nice graphical hacks to enhance the game enjoyment. Please read the information file for further details. saito Hacking Romhacking, Translation, Testing & Documentation.